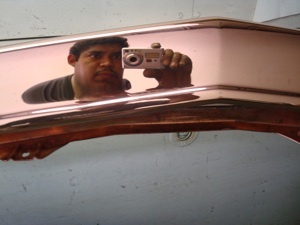 The statement "triple chrome" means Copper, Nickel and Chrome. 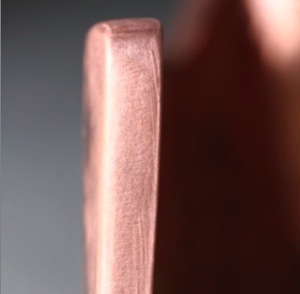 Copper is for adhesion and building layers. 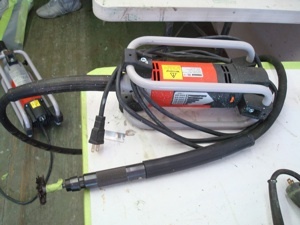 It can be built up and sanded to remove the scars and low spots. Nickel is next and gives you the brightness you see. 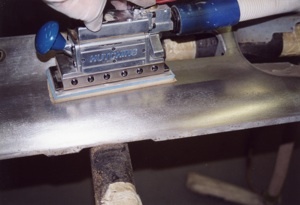 Chrome is a protection coating to keep the nickel from tarnishing. 1. 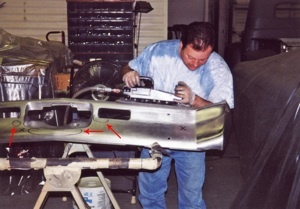 Starting with a good core is vital and the first step is to have the nickel and chrome layers striped off to reveal the bare metal. This is done by the plating company. 2. 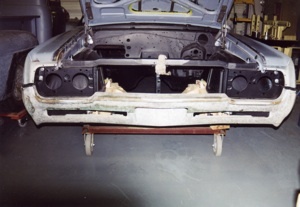 We reinstalled the bumper to check the fit and will adjust the alignment before going any further. 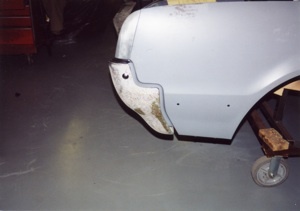 This bumper has a 1/2 inch gap from top to bottom and is 3/4 of an inch away from the body. 3. We removed the bumper and put it on a stand to work out flaws. Here we are tapping out high and low spots with a hammer and dolly. You can also do this while the bumper is on the vehicle but the brackets will often be in the way - and it´s much harder on your body. Our particular 3M stand has posts (Red Arrow) to keep it from moving while holding it on an angle. 6. 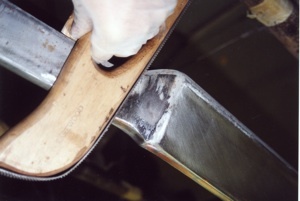 A bull nose file reaches those hard to get corners. 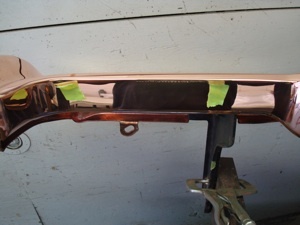 The nice thing about bumpers is that the metal is four times thicker than sheet metal so you have plenty to work with. Tap and file, tap and file until you are happy with the results. 7. 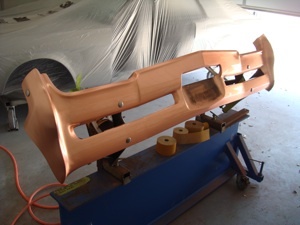 After all the dents are removed and all the metal filing is done we block sand, starting with 80 grit and ending with 400 grit, before copper plating. 8. Keep in mind that steel sands much harder than primers so you have to be aggressive. 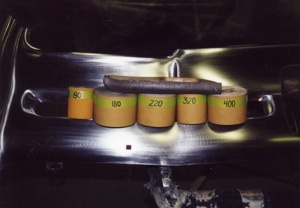 3M has a "Purple Imperial" sand paper that is ceramic coated that lasts four times longer than aluminum oxide (used here), but it is expensive. 9. Round PVC blocks work well in the contoured areas. Notice that there is still some copper on the bumper, which is OK. 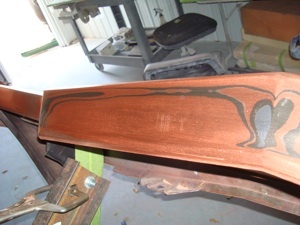 The copper does not always come off during the stripping process because its adhesion is so great. So we sand right over it and continue on. 10. 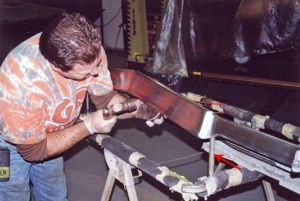 Here we used a long power air board file to knock out a few more flaws. We marked the flaws ahead of time with a felt tipped pen, indicated by the red arrows. 11. After a lot of work and a final pass with 320 and 400 grit paper we wiped the bumper down using wax and grease remover. This gives it a shine which makes it easer to inspect for ripples and flaws. 12. You may prefer working the bumper on the car where it will stay put and steady, but it will be harder on your back. 13. 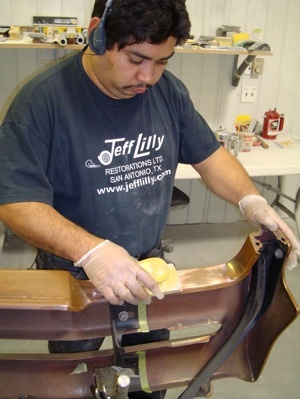 Some areas, like bumper guards, will need special attention to perfect their fit. 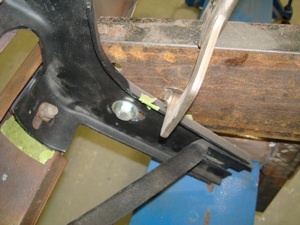 As seen we welded wire to the inside edge to reduce the gap. 14. 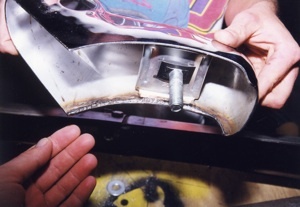 Being able to weld and grind accurately is vital for a razor-blade-thick gap. 15. 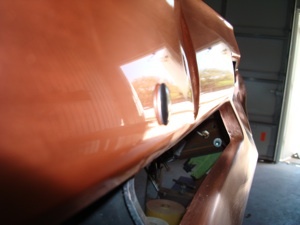 After the metal has been worked and fitted as best as possible we had the bumper copper platted, spending three hours in the tank. 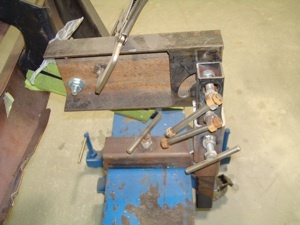 Then we attached it to our I-Beam bumper rack so we could change the angle as needed for the next step. 16. 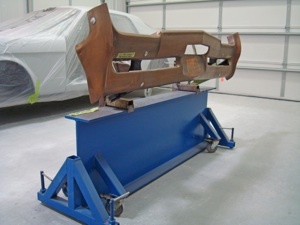 The bumper rack allows adjustments of height and 180 degrees of rotation. 17. We simply clamp against the brackets to hold it in any angle we desire. 18. 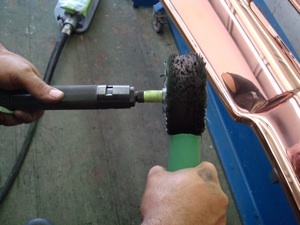 Here we start the process of cutting the copper down with 180 grit paper. Notice the vinyl gloves to keep the moisture from our hands off the copper. Cleanliness is important at this phase. The goal here is to find any low spots and then decide how to deal with them. 19. 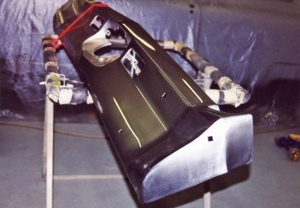 Now we could see a low spot down the center and since we know we had it straight during the bare metal phase we know that this is mostly in the copper plating. 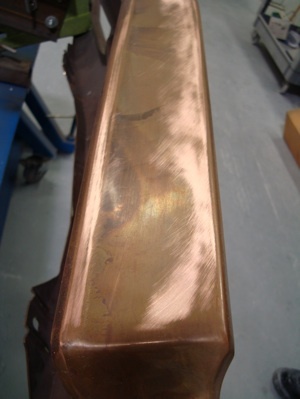 Copper plating tends to build on the outer edges more then the center because of the different amperage draws of the metal closest to the anode. A straight edge revealed that the dip was only 1/32 of an inch deep. 20. As we continue blocking the remaining highs and lows come to the surface. 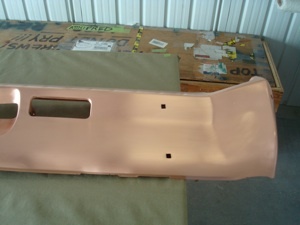 It helps to mark flaws and take photos of them in the bare metal stage so we know where to look for problems after copper plating. 21. 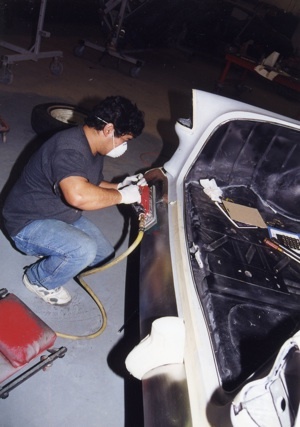 Unlike a car or truck body where you can pull out a spray gun and apply more primer relatively easy, the plating process is much more time consuming and costly. 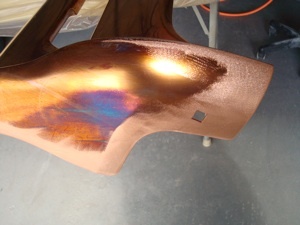 Here you can see that we went through the copper plating in a few places. 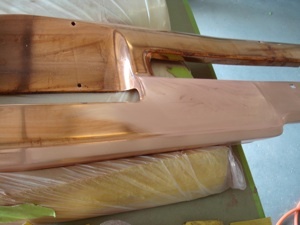 This will have to be re-plated but because it is barely through we can apply just a "strike" of copper, which is a thin coating that only takes 15 minutes in the tank. 22. Sometimes we find a larger area like this top section that needs more then just a strike. 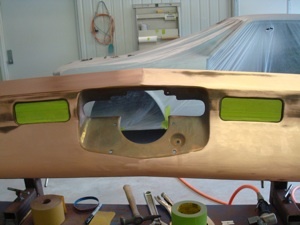 Unfortunately you can not just plate a small area so the whole bumper will have to be re-plated and block sanded again. This is why it is so important to find and fix the low spots early on. 23. Here we wet it down for inspection. 24. 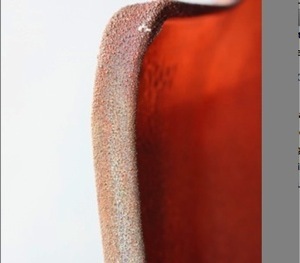 This orange peel grain shows how the copper builds up more on the edges than in the middle. 25. 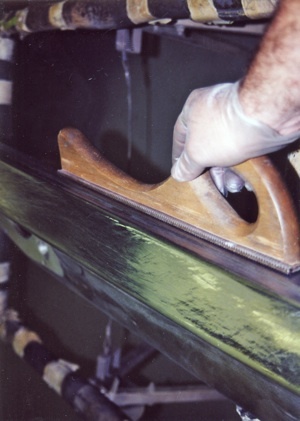 We use a smooth Dyna brade sander to knock it down and then hand sand to a finished state. 26. 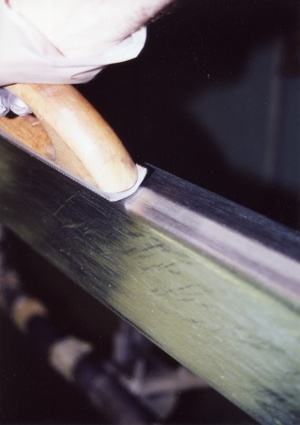 Here you can see that the dyna brade sander leaves a very small curly cue surface. 27. We had a strike put on the bumper and you can see how much smoother it plated next to where we started sanding with 320 grit paper. 28. 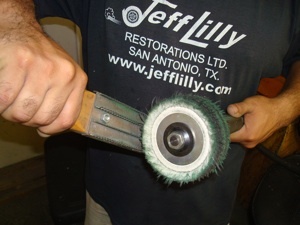 We used 320 and 400 grit paper to finish the sanding and it is now ready to polish. 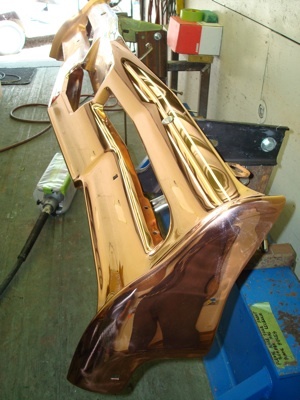 We will polish it to a mirror finish. 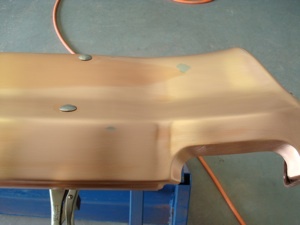 As mentioned earlier the nickel is for the bright silver color you see and chrome protects it, but the real work is in the base metal and copper. 29. One final wet down and inspection. 30. 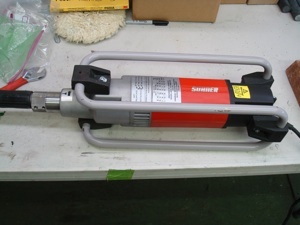 You can use a variety of tools but the Roto Star and RotoSet from Shuner is the ultimate tool. The colett will accept different tools and quick changes are easy. 31. The smaller RotoSet does the small grooves, nooks and crannies. 32. Many bars of compounds are used. 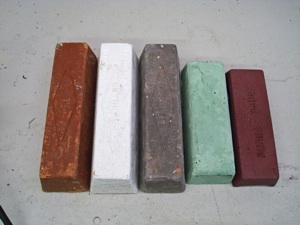 Starting from left to right - rough, medium, fine and final color. 33. 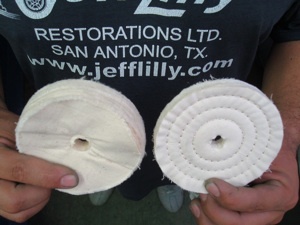 We use a variety of buffing wheels most notably the final color buff on the left and the 3/8 spiral sewn on the right, The amount of space between the threads of the buff "stiffens" the wheel making it more aggressive but less refined. A 1/4 inch sewn would be more aggressive and 1/8th. Experiment for the best results. 34. Never use different compounds on the same wheels because once they are coated with a certain grit it is ingrained in to the wheel. And always clean the buff between rounds. 35. As we start polishing you can see the shine come out. 37. 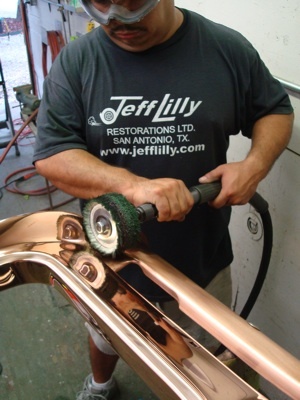 As we buff we wipe the copper down intermittently with wax and grease remover so we can inspect for scratches. We marked some questionable areas with tape for photographic reasons but a felt tipped marker works best. 38. Here we take pictures to show the customer our progress. 39. 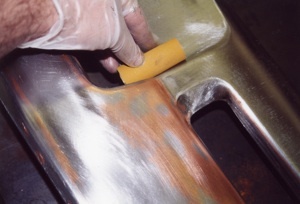 The finished part is ready to plate with the nickel and chrome. It has been a tedious, time consuming process but the final results will be worth it. 40. 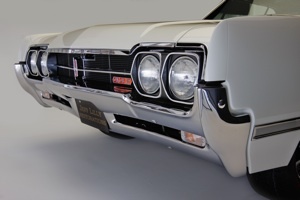 The finished bumper is true show quality!